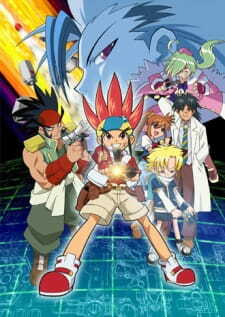 I came across this anime series when i was searching for an anime for kids which has at least 50 episodes. I saw first episode a couple of years ago and dropped it considering it is too childish. It is about a boy named Hitto who stays at rented house of his friend Nana, who takes care of him everyday like waking him up and doing shopping for him. His father leaves the house for unknown reasons and so the town people give him generously groceries etc. One day as he was waiting for his father's letter on his birthday, Hitto receives a gift box sent by his father, a Bidaman Ifrit. So the story progresses as he comes across with new friends and there will be tournaments ( not so focused in the plot) and evil plot to rule the world using Bidaman unleashes in later episodes. Characters: Hitto's father is the strong character, which stays persistent till end of the anime series. He is a father who tests his son by wearing a mask to see how well he improved. He even observed his friends secretly (can be perceived but not shown in the anime) and he makes special Bidaman for his friends. Another Character that is good is of Kudoh. But as usual his strong and lone wolf nature seems to be influenced by Hitto and changes in the last episodes. There are lot of characters which are completely not shown in later parts of the story. For example, Princess Darami and DJ Baku. The story of 7 Bidaman warriors (who can destroy the evil) is not shown properly. Hitto dreams in last episode of gathering 7 Bidaman light, but is not shown properly. They mention JBA a lot in the story but none except the director was shown and even though a building was blown up no one shows up. It was a blunder on part of the script writers i presume. Teruma, one of the seven warriors seems to have personality shifts and he gets cured at the end of the anime, how? That is not shown clearly in the anime. Art : is Mediocre . Animation wise it is not on par with today's screen quality. There are some challenges which Hitto had to go through and those make it more interesting to watch.